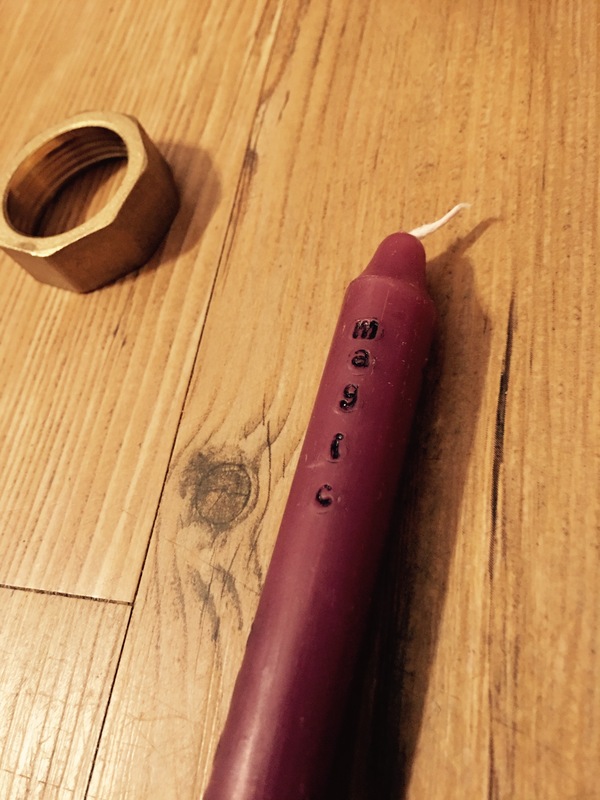 A candle ceremony is a powerful way to connect with several of our beloved transformative elements. 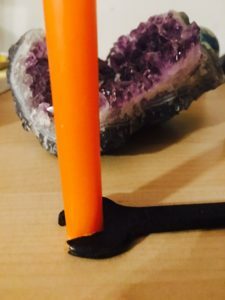 When we attach an intention to a candle and burn that candle, we can deepen our connection to setting that intention and root it into our waking consciousness. Our intention moves from being secured in earth (the candle), to fire (the flame) to air (smoke). Candle ceremonies can be performed as ritualistically or as casually as you like. 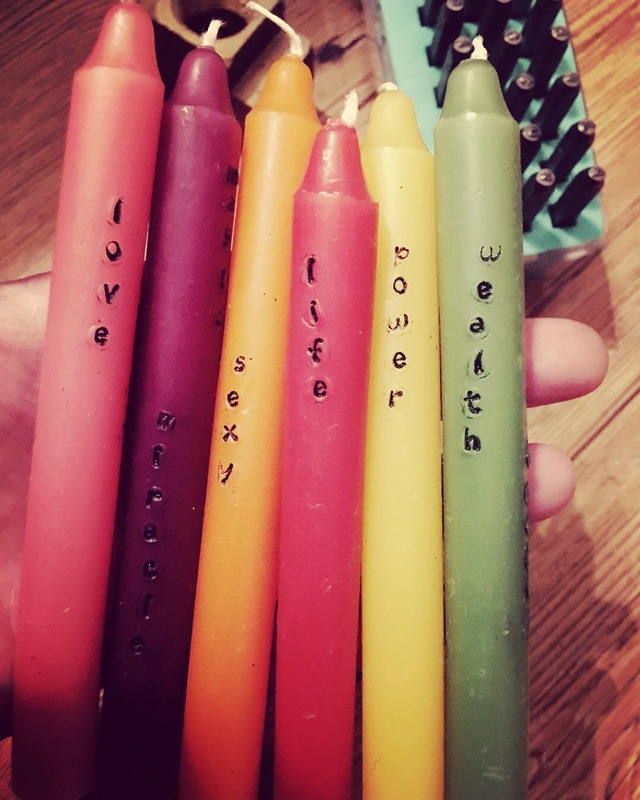 I designed these unique hand stamped candles to make intention setting more accessible in your candle ceremony practice. ~ Choose a quiet time of the day when you can spend a few minutes working with your intention and thus the intention of your candle. 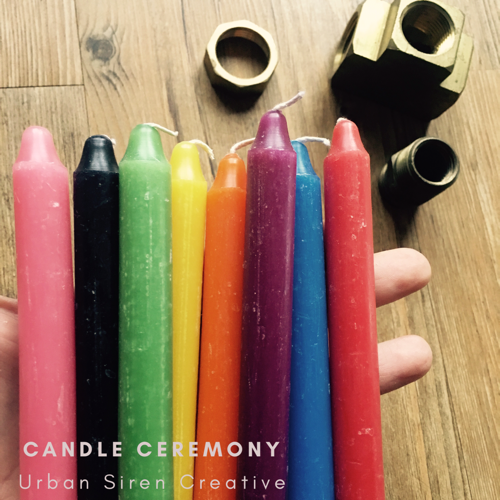 You may choose to play soothing or inspiring music to accompany your candle ceremony, or you may prefer to work in silence. ~ Pick a candle from my Candle Ceremony collection that features the intentions or goals you would like to focus on and make manifest. 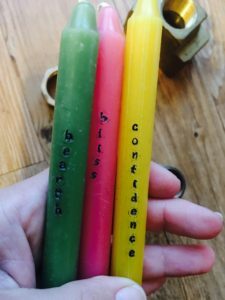 You may also work with another candle of your own and infuse your candle with your personal intentions by focusing on your thoughts while holding the candle in your hand. 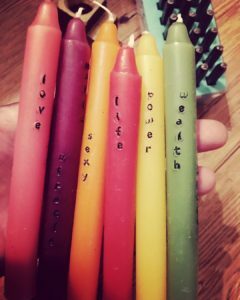 ~ Anoint the candle with an essential oil that deepens your intention. When working with a pink candle with the intention of love, rose oil is complementary to your love intentions. 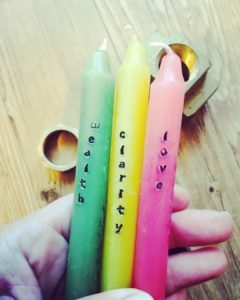 When working with a yellow candle and your intention is clarity, clary sage essential oil is a lovely accompanying oil. Anointing the candle with oil simply entails gently rubbing the candle with an oil of your choice and further infusing your intention into the candle. 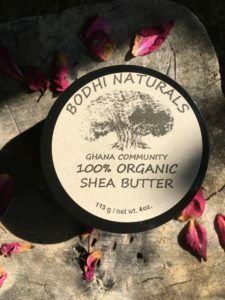 If you do not have an essential oil handy, you may choose from any of my essential oil offerings. You may also use any kind of cooking oil such as olive oil or coconut oil. ~ Always use caution when burning a candle, and make sure that your candle is properly fitted into a secure and non-flammable holder. 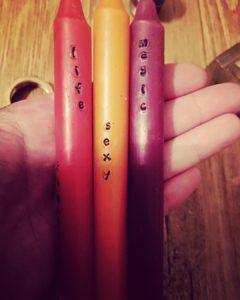 My candles are chime candles and will fit into chime sized candle holders which you may find at craft stores like Michael’s or online. You may also use metal objects that you have on hand in your home or garage as long as the candle fits snuggly and properly within it and does not risk tipping over, and that the materials are non-flammable such as metal. I love using my dad’s wrench as a chime candle holder. You may also use metal nuts to hold your candle upright and safe. Never leave a burning candle unattended, near curtains or on top of flammable materials such as newspaper or fabric. ~ Once your candle is held securely, light your candle and let your eyes settle on the flame for a few moments. You may decide to stay present with your candle for the duration of its burning time (my chime candles burn for about 4 hours). Or you may decide to light your candle and extinguish the flame in increments, depending on your schedule. 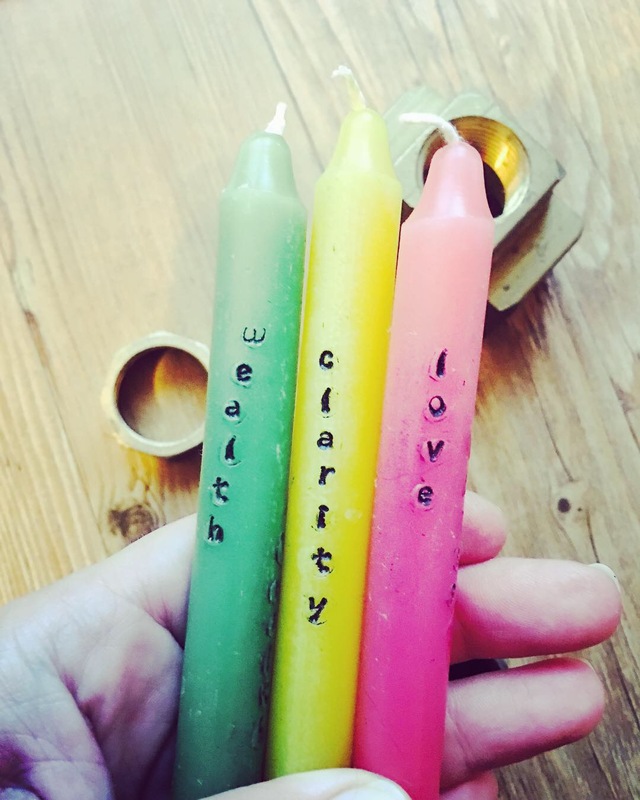 While the candle is burning, focus on the intention(s) you have set and let the concept of your intention begin to materialize as the candle burns. It is a powerful practice to watch the words inscribed on the candle burn down, turn into the light of the flame and then release into the air in the form of smoke. You may envision your intentions being carried to the world of Spirit. This is a wonderful meditation if you work with Spirit Guides or a Higher Power. ~ You may choose to burn more than one candle at a time, depending on your intentions or if you are burning candles on behalf of your loved ones or those you are keeping in your prayers. 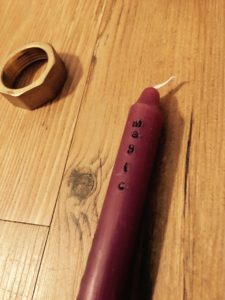 Once you have finished burning the candle(s), you may choose to save the very last bit of the candle and if you tend to burn more than one, collect them to create your own candle through a process of melting down and re-casting the wax. Or, you may wish to bury the remaining candle pieces outside in the soil (ensuring no heat remains in the candle so as to prevent any leaves or twigs catching fire) and say a prayer or reinforce your intention while returning the earthly part of the candle to Mother Earth. 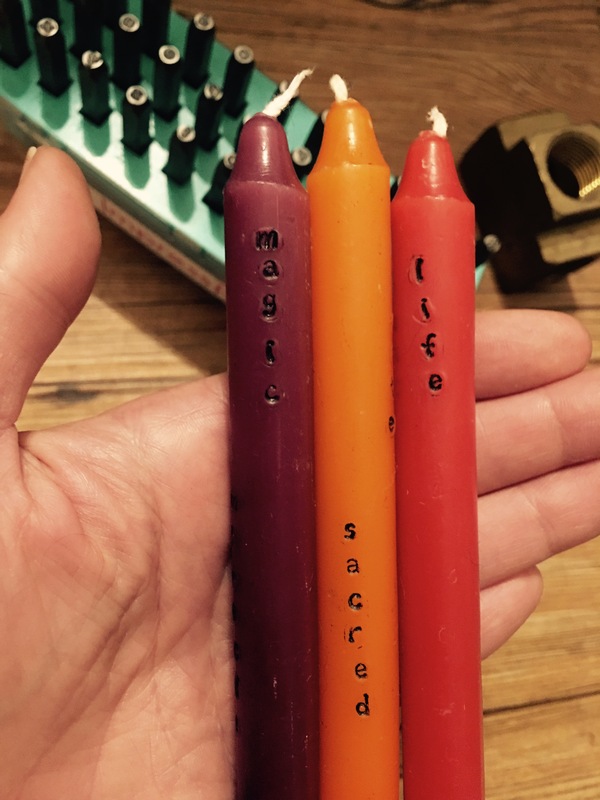 My Ceremony Candles make the perfect gift for birthdays, anniversaries, welcoming a new member of the family, weddings and any other occasion that calls for mindful intention-setting. 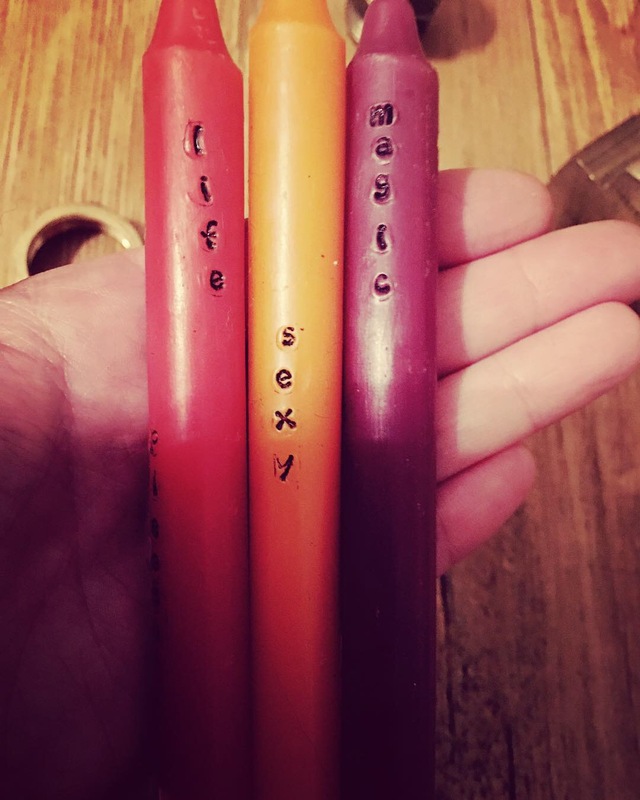 Would you like a Ceremony Candle personalized just for you? 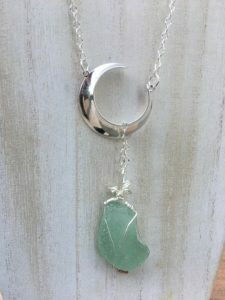 Visit my Etsy shop and request a custom order. As a special gift to you, please click here for my Daily Intentions free download worksheet which I designed to help you focus each day on an intention that is important to you, and to check back the following week to see what developments have manifested.